Thank you for that Peggy! 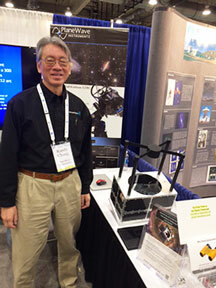 While I was walking around in the exhibit hall, I was surprised to see someone I knew at the Planeview Telescope vendor booth. I stopped there just to window shop and dream of getting a Planewave telescope and discovered that Also Wants to Build a Cubesat, Randy Chung, was there displaying the 12U Cubesat with telescope mockup was there also. Cubesats come in small sizes, described as 1U, which is a cube 10 cm x 10cm x 10cm. A 12U form factor is essentially 12 times the volume of a 1U. They are so low cost and small and light weight that the Cubesats can hitch a ride on many commercial rocket launches into orbit because they can easily fit somewhere on the primary launch vehicle. Many organizations and universities and even high schools have built and launched Cubesats. The Cubesat mockup in the photo is shown with the proposed 21 cm mirror telescope. Randy used to attend the local Cubesat Meetup group with Wants to build a Cubesat, Dr Don, until Randy left and started this other venture. ﻿Separately, another vendor that I always visit is the Cambridge University Press vendor area, usually operated by Vince Higgs. 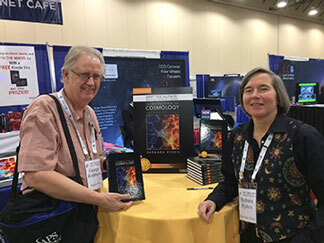 I looked over the 2nd edition of "Introduction to Cosmology" and after reviewing it and finding out that the author was going to be there in the afternoon, I decided to get the 2nd edition. With the AAS discount it was only $39, which is a real bargain for technical books. In addition, I got to meet the author and she signed my copy. I found her first edition one of the best introductory books on the market and she explained some of the new additions which were exactly in areas I wanted also. Now, I guess I'll just have to gift my first edition to one of our science squad members. Thank you Vince and Professor Ryden! Something banged 13.8 billion years ago, but what? The early universe had low entropy, but how and why? 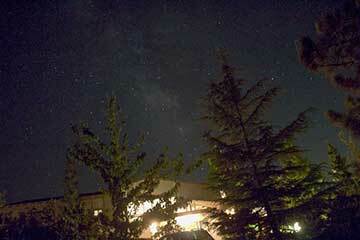 But I'd the Hilbert space is infinite then no need to worry about recurrence. Wow, I am completely exhausted just trying to read through my pen scratches and notes and trying to understand all of this. I do like how the final answer seems to be one which can resolve these issues of entropy, the symmetry of time at the quantum level and the connection seemingly between quantum entanglement and information and gravity. Maybe yo can figure it out. I hope Sean's lecture will show up on YouTube because I need to hear it again. P.S. I forgot to bring the right charger cord for my Surface Pro and it's now out of juice and I and have been trying to write and edit this post on my IPad, which does not support many of the Blogger editing functions, so I hope this whole post shows up ok.